Take a deeper look at Pope Francis’ statement on marriage and the family. “The Joy of Love experienced by families is also the joy of the Church.” So opens Pope Francis’ long-awaited apostolic exhortation, “Amoris Laetitia” (“The Joy of Love”). The statement, subtitled "On Love in the Family," draws on the conclusions of the Synod of Bishops, which gathered over the course of two years to discuss challenges to the family. “Amoris Laetitia” is above all a pastoral document, which the pope intends to serve as “an aid to reflection, dialogue and pastoral practice, and as a help and encouragement to families in their daily commitments and challenges.” We hope this round up of in-depth coverage and expert analysis will serve to deepen your own reflection and open a fruitful dialogue about the joys and trials of families today. "Pope Francis is more the mystagogue than the moralist." “There is continuity in teaching here, but there is also something really new. There’s a real development [of doctrine], not a rupture,” said Cardinal Christoph Schönborn. The pope’s exhortation was greeted warmly by the U.S. Conference of Catholic Bishops this morning and challenged by some others. Pope Francis’s groundbreaking new document asks the church to meet people where they are and to consider the complexities of people’s lives. For many Catholics, discussions of gender and family can be painful. Pope Francis clearly believes there are few, if any, simple “recipes” for what following a formed and informed conscience looks like. Questions of domestic violence do not just affect individual families but larger society. For Jesuits like Pope Francis, "discernment" is not a generic phrase but one with a specific meaning. Let no commentary distract from this stupendous reality that Pope Francis celebrates. “Amoris Laetitia” departs from traditional papal teaching, which generally only referenced the Bible, magisterial documents and the teachings of saints. In dialogue with these doctrinal sources, Francis develops a pastoral theology of family life that explicitly draws from some surprising sources. 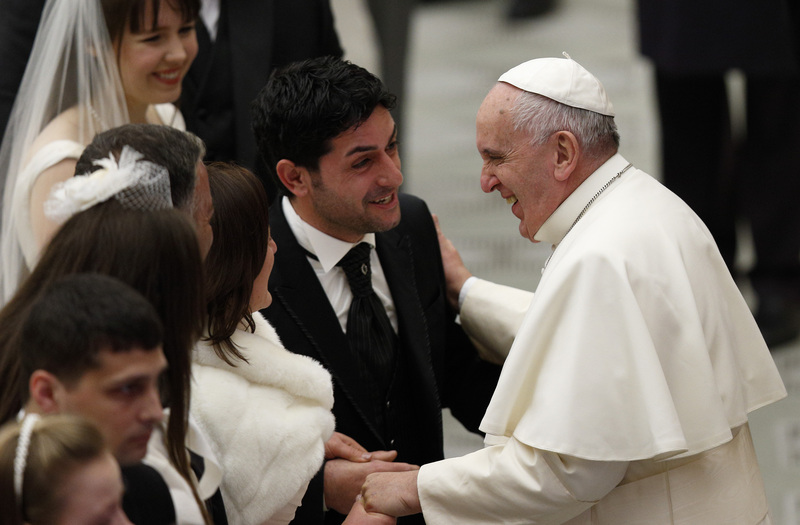 A Pastor to His People: For Francis, the ‘good of souls’ comes first. ‘Salus populi’ is Francis’ refutation of canonists and moral theologians who put rules ahead of people in a mistaken view of pastoral care. Why was Pope Francis’ emphasis on conscience so alarming to critics? Why would a traditional teaching alarm so-called traditionalists? Podcast: What's Conscience Got to Do With It? Prior to the release of "Amoris Laetitia," Pope Francis' groundbreaking new apostolic exhortation, in which the role of conscience was reaffirmed in moral decision making, Matt Malone, S.J., and Kerry Weber spoke with moral theologian James Keenan, S.J., for a primer on conscience issues.